Born at Mungindi in 1877, Charles Gilbert Moodie worked as a tracker for almost 50 years. He commenced service at Mungindi in 1905 and later worked at Garah and Gunnedah before leaving the Police in 1916. 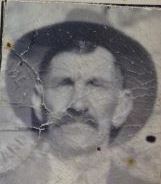 He rejoined as the tracker at Yetman in August 1928 and transferred to Gunnedah in December the following year, where he remained until retiring in July 1951. At Gunnedah, he and his family lived in the tracker’s hut behind the police station. His son, Oscar Moodie, was born at the Police Station in 1935. In July 1943, Moodie’s skill as a tracker was rewarded when he was promoted to Tracker 1st Class. His rank was further increased in March 1946 to Sergeant. A plaque honouring his contribution to the NSW Police hangs in the waiting room of the Gunnedah station. In 2014, a memorial garden was established on the site of the tracker’s hut, land now occupied by the Gunnedah Public School Interviews with Paul Moodie: Gunnedah, 21 April 2015; Redfern, 16 July 2008..
1. ↑ Interviews with Paul Moodie: Gunnedah, 21 April 2015; Redfern, 16 July 2008.